After the banishment of the Heike clan from Kyoto, Awazu no Saburo, a retainer of Taira no Kiyotsune from Kyushu visits Kiyotsune’s wife who lives in obscurity in Kyoto. 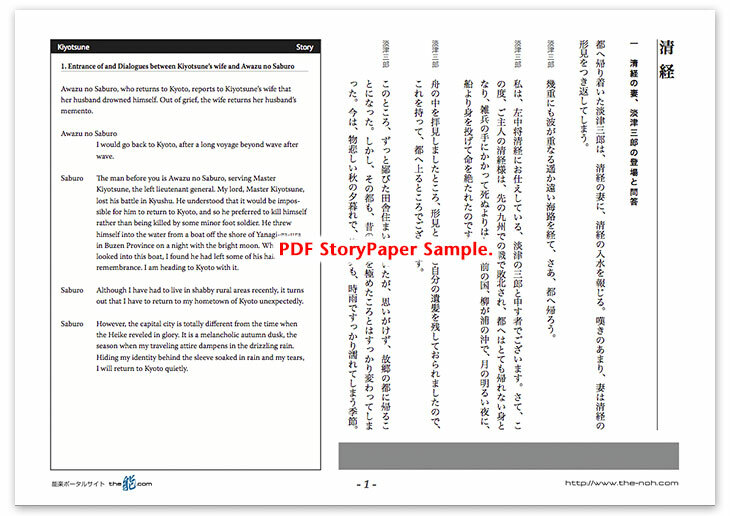 Saburo brings a report to her that Kiyotsune drowned himself off the shore of Yanagi-ga-ura in Buzen Province (present Moji Ward in Kitakyushu City, and the opposite shore of Hikoshima, Yamaguchi Prefecture). Kiyotsune’s wife, who is handed her husband’s hair as a remembrance, bears resentment against him for breaking his promise to reunite and is smitten with sorrow. Then, she returns his hair to Usa Hachimangu Shrine (in the present Usa City in northern Oita Prefecture) because holding the remembrance increases her grief. However, her love of her husband increases even more. When she hopes to see him at least in her dreams, the spirit of Kiyotsune in armor appears in her dream, and the lovers who never be able to meet in this life meet in this way. Although they are happy upon their reunion, the wife blames her husband, who broke the promise of reunion, and the husband blames his wife’s heartlessness as she returns his hair to the shrine. They shed tears of resentment. Eventually, the spirit of Kiyotsune tells what happened until he chose to die and explains that he cast himself into the water to go to Paradise rather than live in this transient world of never-ending suffering. Furthermore he describes the dismal state in the realm of Asura and is saved by the invocation of the Buddha’s name at the end. This is one of Zeami’s masterpieces, written before renouncing the world, and it is still one of the representative pieces of shuranoh (Noh about warriors). 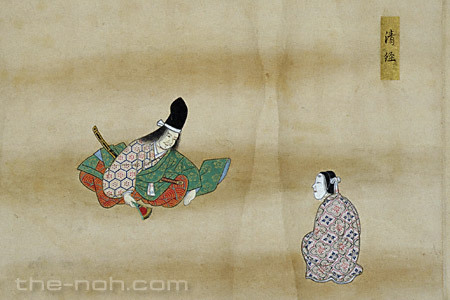 The drama takes the form of mugen-noh in which shite, a ghost, appears in his wife’s dream. However, it follows the style of genzai-noh, which is different in kind from the dual mugen-noh in which the mae-shite is the incarnation of nochi-shite. In his writings of “Fūshikaden” and “Sandō,” Zeami explains how to make shuranoh as it chooses great warriors of the Genji and Heike clans for the lead part and follows the historical stories, and includes battle scenes at the end of the piece. Kiyotsune, who chose death by drowning himself despite his status as a member of the Heike clan, does not follow the typecast of the main character in shuranoh. Kiyotsune was tormented by the sense of loss and desperation at the fate of the Heike clan which was exiled from the capital city. Accordingly, he sought ultimate salvation by belief. The sentiment of Kiyotsune, who chose to kill himself, is described by way of his recollection. The dance of the shite from kuse to kiri, which interweaves Kiyotsune’s imagined scenery with actual scenery, is the highlight of this drama. In an intense atmosphere, the group reciters, musicians, and the dance of shite describe the series of scenery together. It looks overwhelmingly great.